Academy of Interactive Entertainment (AIE) was founded two decades ago by professional video game and CG artists in Australia to service the needs of their then-budding fields. Fast-forward to today and the not-for-profit industry school has grown to include multiple campuses in Australia, an online option, and two campuses in the U.S. While you won’t find courses in Art History or Mathematics at AIE- Seattle and AIE- Lafayette, you will discover highly specialized 21st century training with their 2-year advanced diploma programs. Students choose from AIE’s three programs in Game Art & Animation, Game Programming, and 3D Animation & VFX for Film. Courses are taught by leading industry pro’s who are carefully chosen for their professional experience to rounds out AIE’s comprehensive faculty team. With a typical 25:1 student to faculty ratio, instructors uniquely remain with their class throughout their academic duration, offering meticulous instruction and direct industry feedback. A quick look at AIE’s alumni achievements speaks to the scope of the programs and the skills students are able to zero in on as students. It was high-time we caught up with AIE again in the form of a Q&A and learn about the latest happenings. Much to our pleasure, we spoke to the Head of AIE- Seattle, James Cardo, as well as his AIE-Lafayette Head of School counterpart, Robin L. Couvillon (who we extend sincere gratitude for his participation in the wake of Tropical Storm Harvey… that’s dedication). We hope you enjoy! ACR: James, let’s start with you. You joined AIE- Seattle as Head of School last year. What attributes appealed most to you about the school? JAMES CARDO: AIE drew me in two ways. The first is that it provides practical training focused on career development in an exciting and rapidly growing field. In an environment of tremendous tuition costs and uncertain outcomes for traditional college graduates, AIE’s focused and specialized programs in game art, programming, and visual effects struck me as an excellent option for talented students who know what career they want to pursue. The second draw was AIE’s non-profit status. We are a 501(c)3 which affects how we do business, set our tuition rates, and interact with our students and alumni. Our non-profit mission is to catalyze the industry with great new talent, which makes AIE a superb place to come to work each day. ACR: Robin, likewise, what do you value most about AIE and your role as Head of the Lafayette campus? ROBIN L. COUVILLON: As James has said, the mission of AIE is that of a non-profit organization teaching a relevant curriculum and skills to future leaders in the industry. I have been in education for over 27 years and have held various positions at every level. 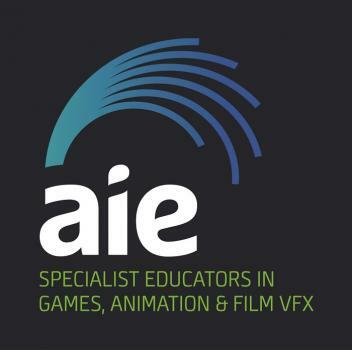 AIE is unique in that it offers training for careers in the gaming industry and film industries, and it is an industry-based curriculum. By that I mean the curriculum is constantly changing due to the changes in the skills needed to be successful in industry. ACR: How does AIE’s mission to train the next gen of game, 3D and VFX artists and programmers impact what students learn, and what they don’t learn? JC: AIE’s entire academic approach is about immersion in the field and preparing students for a career immediately after graduation. I describe it as a 21st century trade school- our programs train students specifically in the tools, methods, and crafts used in real game studios today. We work actively with our industry advisory board to ensure that our curriculum and materials are up to date and meet industry standards. Students learn all that they need to be functional, capable members of a studio team. What they don’t learn is anything extraneous. AIE is not a fine art school, so while there is sketching and discussion of art techniques, the artists will not spend hours in figure drawing courses or oil painting seminars. Equally, the programming track is not a full Computer Science degree but a practical training course for game development. In most all cases, the career driven skills and outcomes far overshadow the theory or the history. RLC: The question should be more particularly, how well did the student learn the skill and how well can they demonstrate that skill to a potential employer in their chosen field? The answer is that during their tenure in the two year curriculum they are assessed and must demonstrate their skills and apply them to a project-oriented task. Our industry-based curriculum and project skills approach is very beneficial in preparing the student for what they will experience when they do graduate and get a job in their chosen field. Students work in many projects together where they create assets for the overall project success, and they realize how important their part is to the success of the whole. Our teachers teach the ability to think, which a major skill lost in all traditional education today. ACR: I imagine that student workload is fairly significant at AIE? JC: AIE runs its courses on a studio model. It’s unlike most any other college. Our advanced diploma programs run for 1800 clock hours over two years, which equates to 21 hours per week in formal class. The courses run work-like days from 9:00am to 6:00pm with an hour for lunch… just like a real job! Time spent outside of class varies dramatically. Very little academic work is required of students outside the studio, but the most successful students are putting in real time honing their skills, expanding their knowledge, and working with others on side projects. ACR: Given the small class sizes and project-based learning, what is the student-teacher relationship like at AIE? JC: The game and film industries have a preponderance of team-based workflows. AIE’s training is focused on that team, and in this sense, the faculty members are often a student’s first ‘boss’. Our teachers run their classes for the full two years; that can be 1800 hours of contact time between a faculty member and a student! It’s a close relationship of mentor, guide, coach, and teacher. All of AIE’s faculty have industry experience, and they’re eager to share their real-world knowledge of studios and the creative process with the next generation. ACR: Let’s talk more about those instructors. You carefully select them from broad professional backgrounds in industry. Why do you think they enjoy and appreciate the opportunity to teach at AIE? JC: AIE teachers have a wealth of experience, and we attempt to hire new faculty in a way that compliments the skill set of the whole faculty team. They are an exciting and creative group who form close bonds with the students in their classes over the two years. It isn’t hard to recruit faculty to AIE. Some of that is because they get to teach in a studio environment more than a classroom. Some of it is because of the ethical and open way AIE does business as a non-profit college. Lots of it is because of their ability to shape, mold, and guide the next generation of developers. AIE carries a lot of the positives of the old medieval guild system with masters, journeymen, and apprentices. ACR: We can’t talk about AIE without talking about the close industry connections it has cultivated and how it helps to shape the curriculum. JC: Our founders conceived of the school as a feeder for studios in 1996, and we have grown those bonds for more than 20 years since. In the US, our secret weapon is Cami Smith who runs industry relations for both the Seattle and Lafayette campuses. Through Cami’s efforts, we have industry speakers on campus, studio artists and hiring managers reviewing portfolios and resumes, and field trips to local studios to meet with the professionals where they work. The ties are close, and we always seek to strengthen them. Currently, we’re working to increase and formalize our internship and project development opportunities with local studios and other businesses. We’re hoping to change the model in a way that increases the positive outcome for both industry and the students. ACR: You alluded earlier to your industry advisory committee. What role do they play? JC: AIE has a robust advisory committee for each academic program on each campus. Those committees meet with faculty and administration twice a year. The meetings include a careful review of course content, teaching methods, resources, and outcomes. The suggestions are then adjusted into the course to increase the desired skills for employers. One example of that occurred recently with job specialization. Especially in the 3D Animation & VFX program, our graduates were showing solid broad skills as generalists but were lacking the honed skills that really only come with practice. In the 2016-2017 school year, VFX added a ten week course on Specialization that allows a student to research a narrower industry job, find out more about its requirements, and then undertake a project that would allow learning, practice, and demonstration of those needed skills for that position. It was likely the most popular unit in that course for both the students and the teachers. RLC: Our teachers are one of AIE’s reasons for success. The advisory board members are like the first mate or the rudder on a ship that keeps it sailing in the right direction. Their invaluable knowledge of current trends in the industry and what softwares and techniques and skills are being used in industry is constantly incorporated into our curriculums. Yearly, our teachers all get together in Australia and hold a curriculum conference. This gives teachers of all tracks a chance to intermingle and share techniques and skills, but also share comments for advisory board members from around the world. JC: There is not a conflict between education and industry needs for AIE. We are not a theoretical school, and it’s not our intention to teach students how to develop historically for the Atari 2600 or the SNES- though that’s awesome, and many of them could! The industry has a need for capable and knowledgeable problem solvers who are up to date on the newest tools and methods. AIE seeks to provide them with those employees, so our educational model is about meeting those needs. Every studio has different needs and requirements, just as the AIE graduates have varying interests and specialities. Based on what AIE has tracked with its alumni, we know that the studios and the graduates have been able to find good fits on both sides. ACR: VR and AR are the mainstay topics these days. What do you make of them, and are either integrated into AIE’s curriculum? RLC: I believe as technology advances, AR will overtake VR. And that Artificial Intelligence and Realtime Gaming Environments will be the future. JC: All of us hear a lot about VR and AR, and there are aspects of that development in AIE’s curriculum. We’re pleased to have devices from Oculus, HTC, and Playstation on campus for student projects. We have an alumni on Microsoft’s HoloLens team. In truth, our art and programming tracks already fit with VR. Much of the work that those students would do on a traditional game is pretty easy to port over to a VR device. The real trick with it is the design of a VR experience versus more traditional game play. Motion sickness is a killer with a new game! AIE has students actively interested in VR and AR development, so we’re seeing it bubble up steadily in student exercises and projects both on and off campus. RLC: Our Industry Relations persons begin on Day One with the first year students getting them to think realistically about jobs. They must first find their dream job, and then make a plan to develop their skills and techniques to secure such a job. Second year students are counseled on resume creation, portfolio development, and interview techniques. Around Christmas time of second year, students are interviewed by industry people they do not know and given feedback as to what they need to work on. JC: As Robin says, career counseling and development starts on the very first day at AIE. Our intention is to catalyze the industry by getting our graduates out and working as expediently as possible. Through a combination of Student Services, the faculty, our industry partners, and most especially our Industry Relations Department, AIE gives steady support to students and graduates with our career development. This includes helping them find their passion and the job they would like to have. It includes preparing resumes, portfolios, and a winning online presence. AIE encourages networking with our own speakers and events as well as the many meet-ups all over Seattle. We also have studios and recruiters coming to AIE around graduation wanting to see the “new crop” hitting the market. We do all that we can to match those studios up with hungry new developers ready to leap into the industry. ACR: Given its birthplace in Australia, I imagine there’s a significant global alumni presence for AIE grads? JC: AIE alumni networking is growing rapidly. Our US schools are able to keep in touch closely with each other and our Australian counterparts. There is increased communication between faculty and staff, which is spreading to the students. We push the message to students that their classmates are their first network. As they graduate and enter the industry, they keep those ties with those who are still in school. Even better, many of our past alumni are finding themselves in hiring positions, and they know the capabilities and skills of their fellow AIE alums. ACR: AIE campuses in both Seattle and Lafayette offer workshops and summer camps for kids and teens. Can you tell us about these initiative and the ‘pieces of the puzzle’ that they fill for both AIE and the future of the industries? JC: There is a real thirst for technological learning amongst middle and high school students. Lots of state and local money has been poured into STEM, and some of it has had a great effect. For AIE camps, workshops, and high school skills center courses, our advantage is the established pipeline of what we teach. Unlike a general education teacher trying to create a lesson with a strong practical outcome, the AIE lessons are based on years of proven college success. There is an immense amount to learn, and it changes constantly. Helping to train up the younger students only makes them that much more prepared for programs like ours. In turn,that helps AIE turn out even more qualified graduates with stronger backgrounds and deeper skill sets. RLC: Also of note, our summer camps are outreach to our communities. No student is denied an opportunity to attend a camp due to financial reasons; that’s part of our non-profit mission. These summer camps and workshops are a great opportunity for students to get a glimpse of the world of game development and filmmaking. ACR: Last but not least, what learning outcomes do you want every AIE graduate to leave with? RLC: To think on their feet and apply their skills to any situation or project that they are presented with. When they secure employment, to never forget where they were two years before graduation, and to give back to the industry. JC: Interactive entertainment - games, film, VR, mobile platforms - is developed almost exclusively out of team-based studios. AIE centers on the technical skills, but we’re equally intent on the many soft skills that a great team member needs. Collaboration -working with diverse people, valuing individuality, and being mutually supportive. Communication -listening well, analyzing needs, and following up. Problem Solving -strategizing, gathering resources, and self-reflection. Plus responsibility, timeliness, patience, and accurately judging one’s performance. AIE works specifically to turn out a total package team member.